A number of regions have identified small problems and uncertainties about issuing the first warrant (previously a Permit) to a new Scouter, once they have completed Stage One Training. That was previously the Permit Phase Training (PPT), and is now known as the Introduction Adult Leadership Training. In discussion with these Regions, Exco has agreed to amend the Adult Support Policy. After the Stage One, Introduction to Adult Leadership Training, a “Limited Warrant” should be applied for, on the RALA form, for a maximum period of 18 months. That warrant will then be issued. After 18 months it will lapse and can only be extended on approval of the RC, if there are valid reasons why Stage Two Training- Warrant, has not been completed. The revised section 4.1.2. of the Adult Support Policy is on the website here. The new Adult Support Policy 2015 has been ratified and can be found here. There has also been some confusion about the current process to apply for a full Warrant for, say an Assistant Troop Scouter, who holds a Permit or in future a “limited Warrant” (and who has competed the warrant course) or a “full” warrant which is now expiring. In all these cases the process for a new appointment, as in the AS Policy, should be followed, and a Record of Adult Leader Appointment (RALA) form completed. A “New” Warrant, for the period requested, maximum 5 years, will then be issued, with a “new” SSA number, on the new warrants register. To ensure all Warrants migrate to the new SSA format and register please note that “old” warrants cannot be renewed and a new warrant must be applied for. Only when a warrant issued on the new system, with an SSA number, is expiring, should the “renewal of a warrant“ be applied for. The first “New” SSA Warrants will only expire, and therefore require renewal, in about 3 ½ years’ time. The form to apply for renewal of a warrant has been removed from the website for now, to avoid confusion. Let’s tell everyone that volunteering feels good! 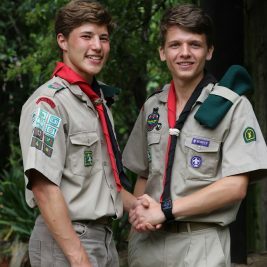 Scout friends receive Springbok Award together!